This week we get a Tuesday blog ’cause it’s my blog and I feel like it. I hope you all had a wonderful Easter full of chocolate (yay for chocolate holidays!) and whatever else floats your boat (family, friends, and hopefully days off). Anyways, Easter got me thinking. About the Easter Bunny (what a shocker, hey). But when you do actually stop and think about the Easter Bunny, it’s really a rather strange phenomenon. I mean, a rabbit that delivers eggs? Wikipedia knows all. Here’s the DL. In antiquity, both rabbits and eggs were symbols of fertility and thus, springtime. At the same time, eggs were a popular food to abstain from during Lent. People would boil eggs to preserve them through Lent. Presumably, they painted them for kicks and because they’d be looking at them for awhile. German mythology arose that good children would be given eggs by the Easter Hare (not rabbit). Chocolate eggs seem to be a more recent development (sorry, hon). But maybe the bad children got rabbit poop. 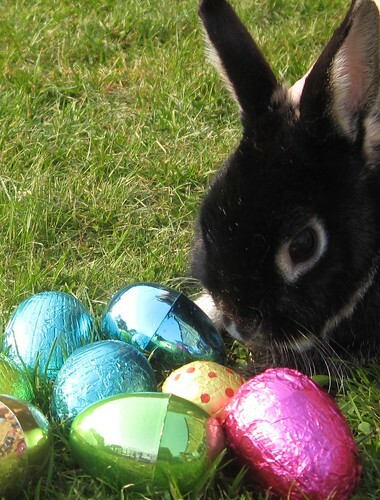 So tell me, readers, did you know about the history of the Easter Bunny? Ever wonder? Ever…have theories of your own? :D Let me know in the comments!